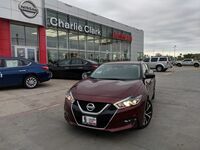 When it comes to incredible performance and a thrilling driving experience, the 2019 Nissan Maxima knows how to give you exactly what you want in a new car. The 2019 Nissan Maxima is Brownsville, TX has a powerful V6 engine, a long list of performance features, innovative technology, excellent comfort, high-tech safety features and sporty good looks which is why it’s a top pick with drivers who are looking for a new sporty sedan. The 2019 Nissan Maxima is a four-door sports sedan that delivers the driving dynamics, performance, and horsepower you need to have fun behind the wheel. With multiple trim levels to choose from that include the S, SV, SL, SR, Platinum, Platinum Reserve, you’ll have an easy time finding a new 2019 Nissan Maxima that has all the technology, comfort and safety you’re looking for in a new car. On the inside of the new 2019 Nissan Maxima you’ll find an impressive number of innovative technology features and luxurious comfort options to choose from. With its many different trim levels, the 2019 Nissan Maxima in Brownsville, TX offers everything you’re looking for and much more. The lengthy list of features and options available in the 2019 Nissan Maxima includes driver and passenger favorites like Android Auto™, Apple CarPlay™, Bluetooth®, NissanConnect® Services, a navigation system, an 8-inch touchscreen infotainment system, a rearview camera, dual-zone automatic temperature control, heated and cooled front seats, remote engine start, push-button start, power windows, power seats, leather upholstery, a Bose® premium audio system, USB ports, SiriusXM® satellite radio, and much more.